Three ballot questions will go before Massachusetts voters this November. Question 3 asks whether voters approve of a state law allowing transgender people to use public accommodations that match their gender identity. But do voters understand what voting 'yes' or 'no' means? A WBUR poll released Tuesday sought to find out. In most ballot questions, voting 'yes' means making a change of some kind to state law, while voting 'no' means preserving the status quo. Question 3 is the reverse: a 'yes' vote approves of the 2016 law that offers protections for transgender people in public accommodations, while a 'no' vote disapproves and aims to remove it from the books. Even on simple ballot questions, voters can be confused by the wording and the implications of a 'yes' vote versus a 'no' vote. After all, it’s how voters mark their ballots that ultimately counts. If they meant to support the law but voted 'no' because they thought that would be a vote against repeal, it still counts as a 'no' vote. 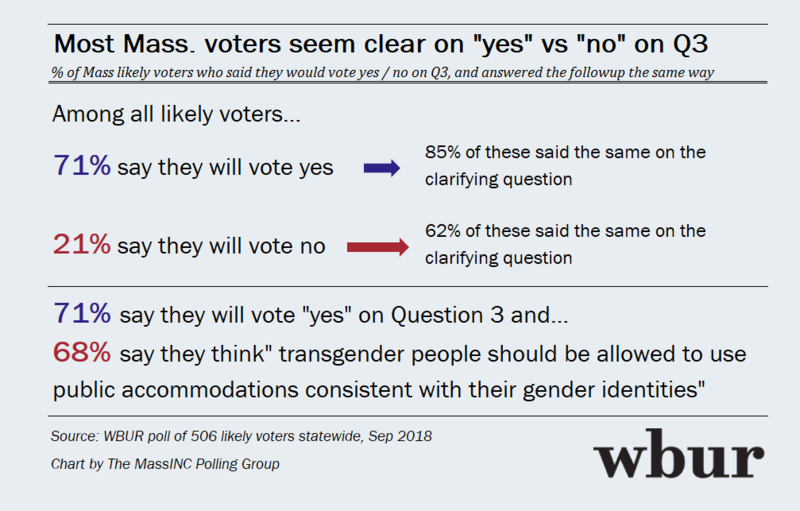 The WBUR poll tried to capture that confusion by first asking likely Massachusetts voters the question as close as possible to how it will appear on the ballot. To test whether voters were indeed confused about how to vote, the poll then included a follow-up question, restating the aim of Question 3 in simpler terms. Looking at the two questions together revealed most voters seem to grasp the meaning of a 'yes' vote versus a 'no' vote. About 7 in 10 voters answered 'yes' on the ballot question to approve of the law. On the follow-up, about the same number said transgender people should be able to use public accommodations in keeping with their gender identity. In all, 85 percent 'yes' voters answered the follow-up question the same way. There was a little more confusion among 'no' voters. If the poll showed a closer contest, some of that confusion might affect the outcome. But, right now, 'yes' is up by a wide margin. There is still more than a month to go, and persuasion campaigns and advertisements for ballot questions tend to ramp up in the final weeks before Election Day. For now, though, most voters say they’ll vote 'yes,' and understand just what that means. 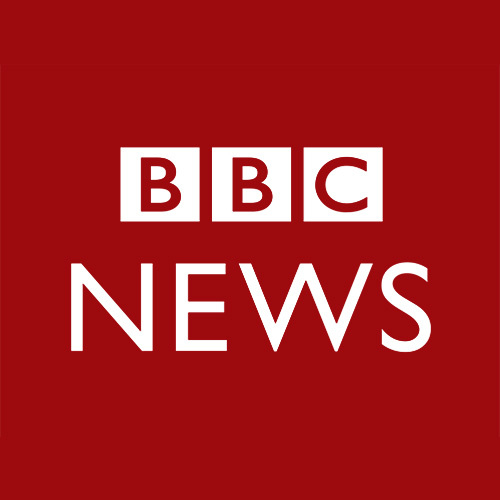 This segment aired on September 25, 2018. 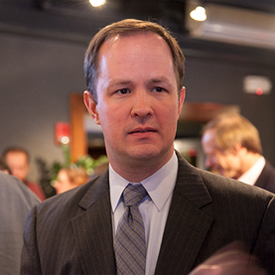 Steve Koczela is the president of The MassINC Polling Group and has overseen WBUR's polling since 2011.